If Bowman Chrome is Army Strong, Bowman Platinum is ROTC Strong - the bite still sings but the venom isn't nearly as lethal. 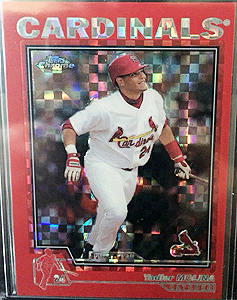 Bowman Platinum has always come in second to Bowman Chrome and has never really achieved the same level of collectibility. Mind you, the Platinum arm is still very nice with some amazing pieces hailing from this line. 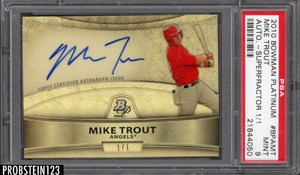 This Mike Trout 2010 Bowman Platinum Superfractor has been discussed in the past. I actually saw this card in person at the 2018 National Convention and it's a thing of beauty. At the time, the asking price was well over $100k. It's nice to see the asking price brought back down to earth. The BIN was still high but I think much more reasonable and at $32k, I think it was a solid buy. 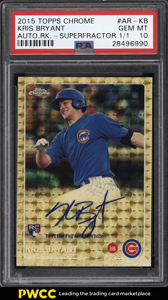 This Kris Bryant 2015 Topps Chrome Superfractor was one of the more talked about rookie year Superfractors and I think the first time this card sold, it brought something like $15k. That was a few years back. Seeing this card close at still into the 5-figure mark is impressive. While Bryant is an established part of the roster of current superstars, I don't think the hype around him will ever be as hot as it was in 2015. This could be said for any top prospect though so it's not really a bad thing; it's just a thing. 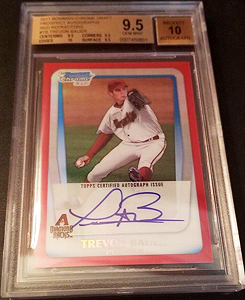 I really dig the design of 2015 Topps Chrome and this card is a real stunner. At $11k, this was another great buy. Hopefully, Bryant will have a long productive career and we'll see is stuff continue to rise in value. I've been following Rafael Devers a little here and there just to stay on top of some of the hotter prospects in the current market. When I first saw this Superfractor, it came with a 5-figure price tag. This is typical behavior of sellers with hot items of hot prospects. Throw the card up on eBay for essentially a down payment on a house and see if the market bites. After a few months of no activity, accept reality and let the market decide its value; this really is the quickest way to move something. At just over $2k, this was a nice add for a card that doesn't have an autograph. I guess I'm biased though since the non-AU thing is more my style. Trevor Bauer has had a great year in 2018. He's kept his ERA below 3.00, struck out over 200, and made the All-Star Team. Those are all big accomplishments for any pitcher and to have them all piled into one year is milestone worthy. His 2011 Bowman Chrome AUs have always been desirable. In 2011, I can remember this card being one of the ones that helped sell the product. He was a super prospect back then and has already put a deep footprint on the mound. While I wasn't too surprised this Red Refractor AU closed at over a grand, I honestly didn't think his stuff still carried this sort of strength but I'm happy to be proven wrong here. It's always exciting to see hot cards from the past continue to be appreciated and this card is no exception. 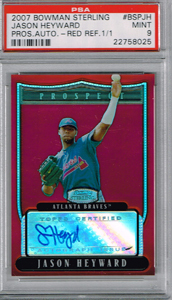 I watched this Jason Heyward 2007 Bowman Sterling 1/1 for what feels like years now. Well, it finally sold. I was hoping the seller would eventually list it auction style but it never happened. I'd have loved to add this to the archive but alas, at least we can enjoy it here. I've been tracking these 2018 Topps '83 Superfractors since they came out. I really like the concept and thought for a moment about creating a gallery of them but to be honest, there are just way too many of them so I just cherry pick certain ones to watch. 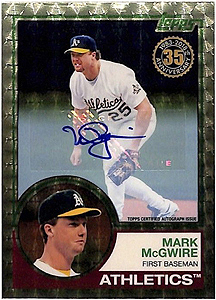 This Mark McGwire stood out to me as the two photos feature McGwire in two different eras of his career. The headshot appears to be more late '80s, while the action shot looks to be from the mid '90s. It's a nice contrast. 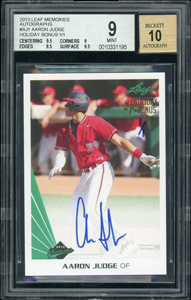 Gosh, every time I see the AU versions, I really wish Topps would've allowed on-card autographs; it would've been the icing on the cake. Regardless, however, these are excellent Superfractors. Sometimes I feel like Aaron Judge stuff has fallen out of relevance. It's a strange thought because I know how talented this kid is and he still has lots of fanfare. Thoughts like this occur when I see cards like this 2013 Leaf Memories 1/1 sell for less than $500. This is a great card to have. It's unlicensed, sure, but it's a nice addition to any collection. I remember when this set first came out. I was excited Leaf incorporated the classic 1990 design. I suppose that's the basis for the Leaf Memories concept anyway. Yadier Molina is poised to be a 1st ballot Hall of Famer. He's one of those sleeping giants that everyone will be paying premium attention to in the near future. This 2004 Topps Chrome Red X-Fractor is such an elusive card. While not stated, the print run on these is 63. I think down the line a lot of us that aren't chasing Molina stuff from 2004 will wish we did. Although I cannot offer investment advice, I have a hunch that rare Molina rookie year cards from 2004 will possess significant importance by the next decade. 2000 SPx Spectrum parallels are 1/1s. If you've seen one in person, consider yourself one of the rare ones. These cards possess serious aesthetic appeal. The box-matrix and red foil combination is mentally salivating. I'm a big fan of parallels from this era and SPx has always done a great job with the 1/1 stuff. 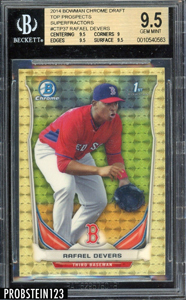 The end price on this Pedro Martinez seems like a bargain for what this card is - an early 1/1. 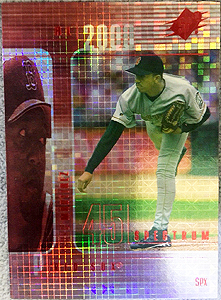 Keep in mind 2000 was just the fourth year of pack issued 1/1s and insertion ratios were still crazy astronomical. That said, any player, literally any Spectrum pulled from 2000 SPx is like the old cliché of finding a needle in a haystack. 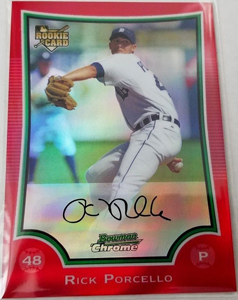 I'd have been the buyer of this Rick Porcello 2009 Bowman Chrome Red Refractor but I had just recently gotten back from the National when this card was listed and my reserve was pretty much deflated. I'd have been happy to fork over $100 for this elusive parallel. I have to credit the seller for providing such a clean photo of the card. It's very pretty.